A valid phone number and eMail address are required in order to process your request. All contact information is confidential. As an award winning golf car dealer, we've been servicing your needs for the past 21 years. Our golf car mechanics are ready to help wherever a problem arises with certified Club Car and E-Z-GO genuine parts and accessories, specialized tools, latest electronic diagnostic equipment, and repair machinery that are required at all four of our locations. Club Car genuine parts, accessories, and service are only available from an authorized Club Car dealer. 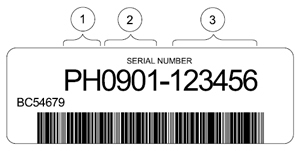 The serial number of each vehicle is printed on a bar code decal mounted either below the passenger side cup holder or above the accelerator or brake pedal (Example: PH0901-123456, as shown to the right). The two letters at the beginning of the serial number (1) indicate the vehicle model. The following four digits (2) indicate the model year and production week during which the vehicle was built. The six digits following the hyphen (3) represent the unique sequential number assigned to each vehicle built within a given model year.